It looks like The Weinstein Company's been doing a bit of rescheduling, and in the process, Vampire Academy fans will get to see the feature adaptation of Richelle Mead's novel a week ahead of its originally scheduled release date. A new trailer for the film has made its way online, noting the new date, February 7. The film was originally set to arrive in theaters on Valentine's Day. In the process of shifting Vampire Academy up a week, TWC has also moved the planned release of David Frankel's film One Chance from February 7 to March 14. And in doing that, they've bumped the Nicole Kidman starring Olivier Dahan film Grace of Monaco from its intended March 14 date to TBD, so we'll have to wait and see where the Grace Kelly biopic lands. Moving away from scheduling changes, let's talk about that Vampire Academy trailer, which teases violence, fangs and a bit of fire. For a thirty-second spot, it does a decent job of breaking down the basic plot of the film. Zoey Deutch plays Rose Hathaway, a Dhampir and Guardian in training, whose life's mission it is to protect her best friend Lissa Dragomir (Lucy Fry), a Moroi (peaceful, non-immortal) vampire. And they attend a fancy high school with other Moroi vampires and Dhampirs. Violence, school related social activities and hopefully some great dark humor — courtesy of screenwriter Daniel Waters (Heathers) and director Mark Waters (Mean Girls) — are expected to ensue. One other thing stood out to me in this particular trailer, which is the mention that a "new breed is out for blood." In the book, the threat comes from the Strigoi vampires. They're the immortal, murderous, allergic to sunlight-type vampires that have a particular appetite for Moroi vampire blood, and unless I'm mistaken, they're not new. Am I forgetting something about the book or is that a shift from the original story? Either way, anyone catch this creepy looking snippet that followed the mention of the "new breed"? 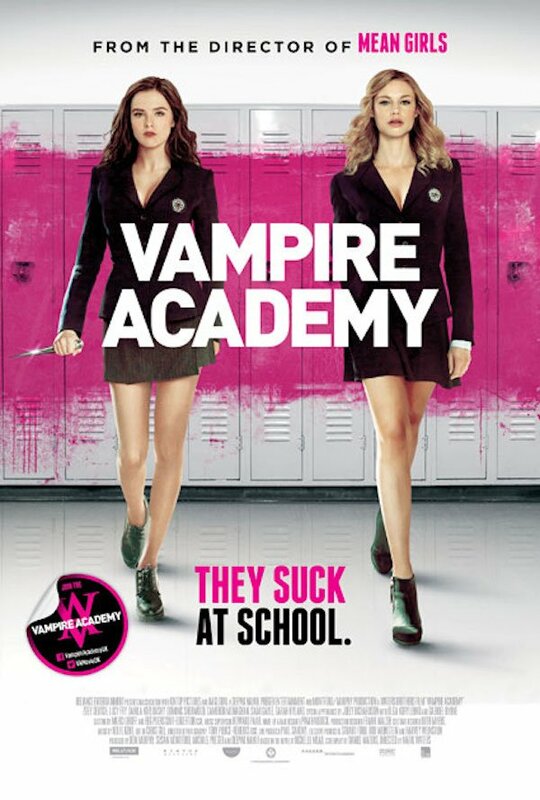 Just the other day, we shared some other updates on Vampire Academy, including the international poster, which you can view below, and word that the soundtrack is available for pre-order. Amazon still has the soundtrack's release date set for February 11, but with the film's release date moving up a week, perhaps the album will come out a bit earlier too.